The Monastery of El Escorial was the first example of the architectural style which came to be known as Herrerian after its creator, Juan de Herrera. It is a designated World Heritage site. Philip II used this Royal Site for his family mausoleum. Construction work began in 1563 under Juan de Toledo, and on his death was continued by Juan de Herrera, who completed the building in 1584. The granite construction is divided into three areas, with the Kings' Courtyard at the centre. There is a 55-metre tower at each of its four corners, each crowned by a metal sphere. The compound includes the Ministries, Casa de los Oficios artisans' houses, the Compaña or barracks and the apartments of the Infantes and Queen, all connected via arches. The church is laid out in the shape of a Greek cross and there are funerary monuments to Charles V and Philip II in the main chapel. The library is also of particular interest. It is on the second floor of the west wing, and contains close to 45,000 documents from the 15th and 16th centuries. It was designated a Historic-Artistic site in 1971 and received the World Heritage designation in 1984. 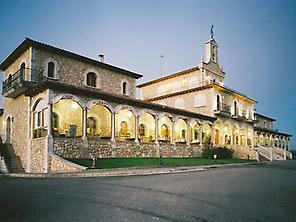 The building was designed by Juan de Herrera and gave rise to an architectural style known as Herrerian. It is a substantial construction, as can be seen from its 15 cloisters, 13 oratories, 86 staircases, 88 fountains, more than 1,600 paintings, nine towers and 73 sculptures.The Monastery is also the home of the Escolanía de El Escorial, one of the most important and historic choirs in Spain. Founded in 1567 by order of Philip II, the singers are 45 boys and young men. 周辺: Church of El Escorial de Abajo (by Herrera), church of San Bernabé (by Francisco de Mora), the Architecture Museum. Ticket office open until one hour before the monument closes. Closed: 1 and 6 January, 1 May and 24, 25 and 31 December, and on days when official events are held, which are announced in advance on the National Heritage website. Free entry: children under 5, 18 May, 12 October, large families (when at least one adult and three children visit at the same time, or at least one adult and two children if one of them is disabled), ICOM members, disabled people, teachers, the unemployed, and Wednesday and Thursday from 15:00 to 18:00, from October to March, and from 17:00 to 20:00, from April to September, for European Union or Ibero-American citizens.